The EUR/RON closed yesterday just below 4.6600 on below-average turnover though larger than recent days. With Asian stock markets in the red, we could see EUR/RON return to the 4.6600-4.6700 range today. ROMGBs saw some buying interest in the mid part of the curve yesterday. The Ministry of Finance sold the planned amount of RON600 million at an average/cut-off yield of 3.75%/3.76%, slightly below our expectations, meeting good demand with a bid-to-cover ratio at 1.88x. The NBR revised its end-2019 inflation forecast higher by 0.2ppt to 2.9% with the risk balance still tilted to the upside. The profile for core inflation was kept unchanged. The NBR governor cited well-behaved core inflation, declining inflation expectations and competitiveness issues as factors for the decision to keep rates on hold. He said that, in the NBR's view, policy normalisation implies that at some point, real interest rates should become positive. 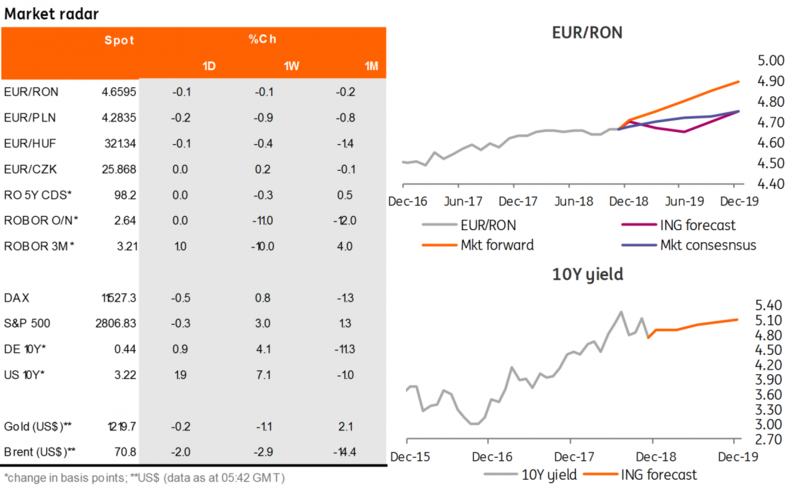 The O/N implied yields inched a bit lower to c.2.70% with the rest of the money market curve better offered.